Jake Bull first stepped foot into PowerStrength 5 years ago as a high school senior. He was a 6’5 225lb athlete who played football, basketball, and baseball for the Hudsonville Eagles. 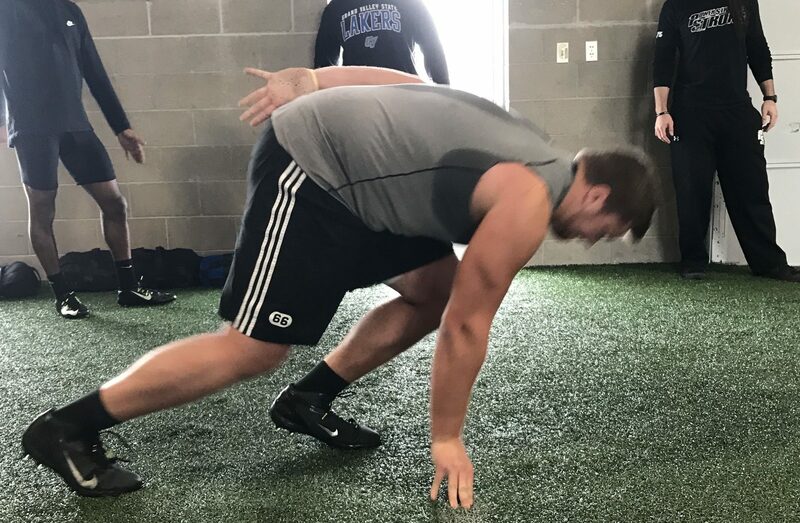 His focus turned to football where he was a standout TE/DE and was offered a scholarship to a small D2 school – Hillsdale College. I vividly remember when he first started. Jake was coming off a shoulder injury and had about 6-months to prepare for his freshman year. He trained 3-4 days per week for the full 6-months and gained over 15lbs of muscle, while adding 5-inches to his vertical. His shoulder was healthy and he set personal bests across the board (he still is setting personal bests and had zero injuries in college). Check out this old school video of Jake HERE. Like most D2 freshman, Jake took a redshirt which allowed him further time for development. From there, Jake was back at PSTS every summer and semester break to train. His consistency and dedication were paying off each year as he continued to impress. Jake ended up starting all 4 years at Hillsdale and was a 2-time team captain. However, the success he saw wasn’t at his high school position. He was moved to the offensive line early on and had to learn a new position, but he quickly put down roots at left tackle. In hindsight, the fact that he went to Hillsdale was a great coincidence given the number of Hillsdale athletes we were training at the time. (Just so happens our GM, Cam White, and Director of Training, Skyler Davis, are also Hillsdale alums. Skyler currently works with Jake every day). He also entered school a few years after Hillsdale-great, and another West Michigan native, Jared Veldheer. Jared was drafted in the 3rd round of the NFL Draft by the Oakland Raiders and currently plays for the Arizona Cardinals. Like Jared, Jake was an athlete that was put in the LT position. Jake even wore Jared’s #66 jersey at Hillsdale. 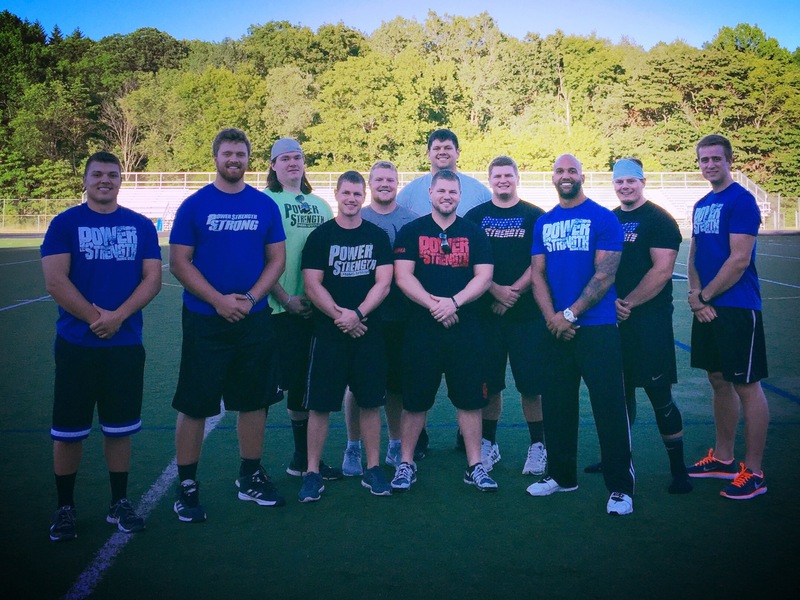 Jake and the PSTS crew volunteering at Jared’s football camp in 2016. Skyler, Mark, and Cam with Jake after a Hillsdale game. 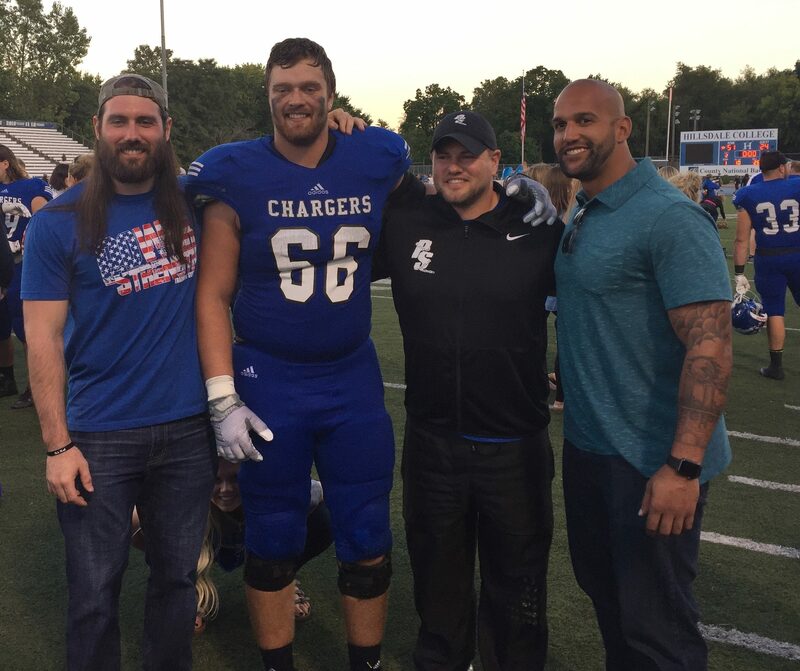 When Jake was coming up through the gym, Jared was also training and the two were able to connect as fellow Charger linemen. As Jake progressed through school his aspirations grew. He witnessed a guy who was from his school, played the same position, and someone he actually knew – fulfill the highest football dream of playing pro football a reality. At PSTS, there were always small college guys working towards the pros as well to provide inspiration. A few times Jared was able to help Jake with a few offensive line concepts and footwork drills. This small dose was enough to fuel the fire and to keep progressing. 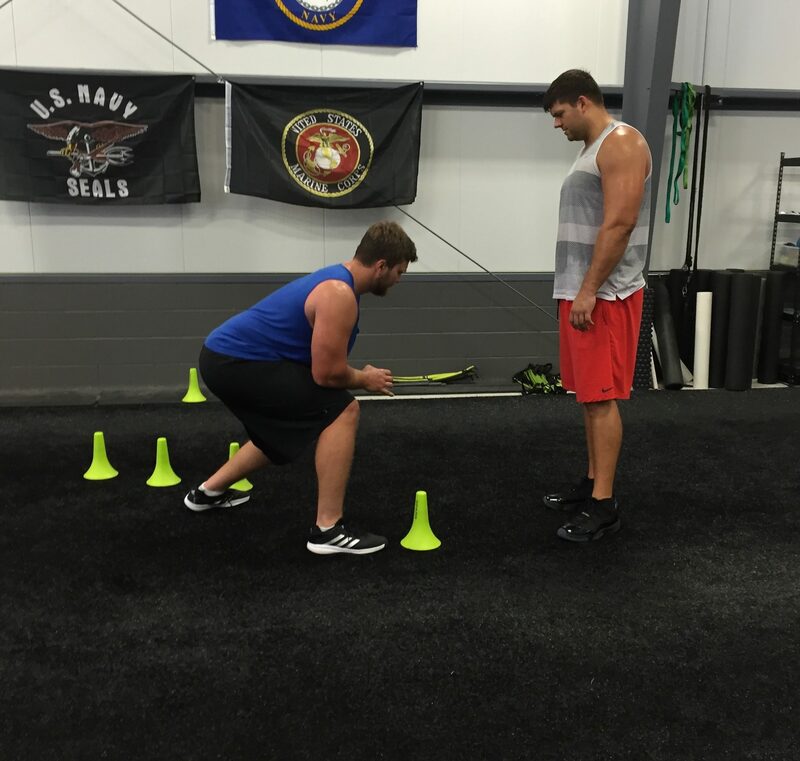 Jake working footwork with Jared Veldheer in the summer of 2016. That’s the main thing about Jake. He has learned and absorbed so much over the years that he has compiled it all into the ultimate professional mindset. It shows up in his approach and effort towards training, how he prioritizes his nutrition and recovery, and how he prepares for the field. Jake is the type of athlete who you only have to tell something once and he’s got it. You never have to question his effort or if he can get the job done. I can tell you firsthand that this is not the norm. 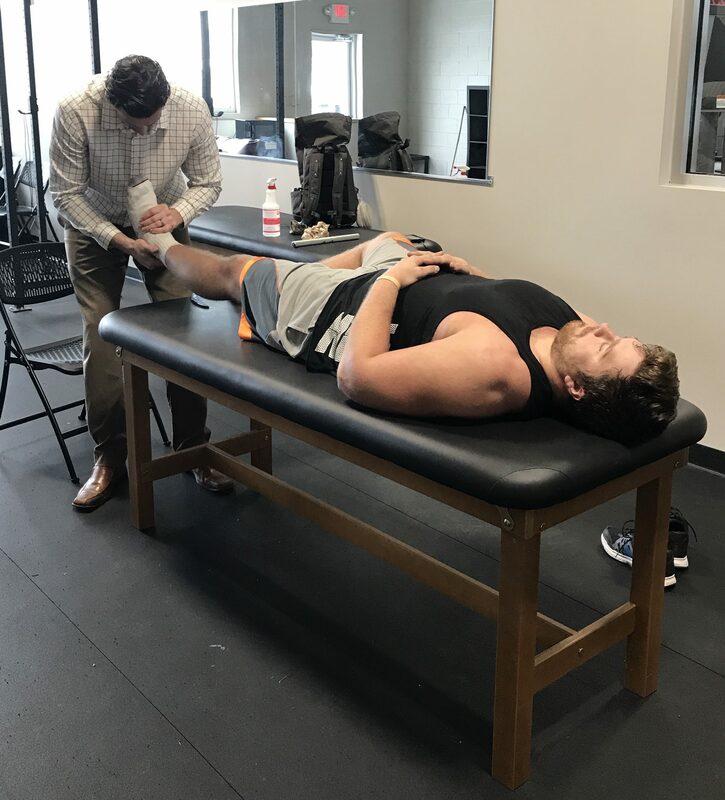 Jake with another Hillsdale football alum, Dr. Reid of Chiropractic Unlimited, during a weekly ART and recovery session. C.U. keeps our athletes feeling at their best! 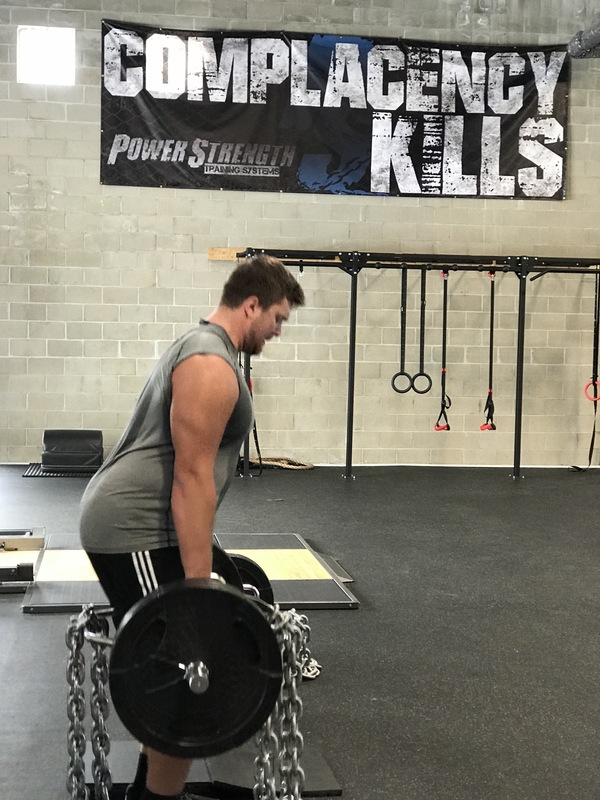 One of our main values at PowerStrength is, “Complacency Kills.” This is a mindset that we aim to instill in all of our athletes – especially the more success they start to see. Jake really took this to heart and it helped him achieve a lot of goals throughout his career. I thought of this as I tossed him a fresh PSTS wristband at the start of combine training. He raised up his wrist as proof and said he still had the old one (from 2015). The writing of ‘Complacency Kills’ had completely worn off and it looked like a plain wristband, but he understood the meaning. His college career ended in November after another standout season. Now it was time to take his shot at the NFL. This is always a hectic time for graduating athletes with a lot of unknowns. The training is tough but guys like Jake are used to that. How an athlete handles himself through the struggles and uncertainty will reveal if they can make it as a pro. Very few have the opportunity, and even fewer have the mindset to build a succesful NFL career. This mindset that Jake possesses is a combination of all his influences and experiences. He understands the privilege to have this opportunity and the journey ahead. Jake also understands to trust what got him to this point – paying close attention to detail and doing it consistently in all areas. The best part of all is that Jake will experience a lot of success because of the type of person he has developed himself to be. He’s working towards starting a successful pro football career, but being a football player doesn’t ultimately define him as a person. This grounded perspective is one of the most admirable, and most valuable, qualities he exhibits. In a few weeks at this NFL Pro Day Jake will turn some heads of pro scouts. At 6’6 300+lbs he will display a sense of athleticism that is rare for an athlete of his size. The days of the sloppy linemen are over. They need to be strong, powerful, lean, tough, and durable. Whatever Jake may lack (some scouts will say his arms are an inch too short…) he’ll make up for in the long-run with his professionalism and approach to the task at hand. He has had an unbelievable last 7-weeks of combine training and we’re not done yet! A lot of young athletes can learn from the Jake Bulls of the world. He is one of our own in West Michigan that worked his way into a great opportunity (like many of our 2018 Pro Day Class ). He is the perfect representation of a PowerStrength Disciple and he has made us all better. Jake does this all in silence and lets his performance make the noise. He’s an offensive lineman through and through and has never been one for the spotlight. However, the spotlight is always shining at the top – Jake just happened to work his way into it.